Things are really hotting up Cybher wise and I'm really excited about the amazing speakers that are already lined up for the first event next May. 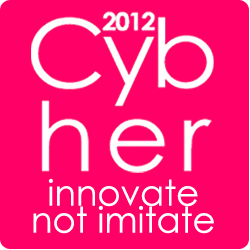 Lots of people have been asking about the schedule and its now live for you to take a look at over on the Cybher site. More sessions will be added over the next few weeks as speakers are confirmed so please do check back. Early bird tickets are on sale at £80 until 30/11/11 and we have a deal in place with a hotel just around the corner who are offering single rooms to Cybher delegates for just £80 per night. These rooms are limited and are selling out fast. Full information is on the Cybher blog.